The Little Bible Books series combines a convenient new size and vibrant new illustrations with the classic, easy-to-understand text parents have come to expect from CandyCane Press. 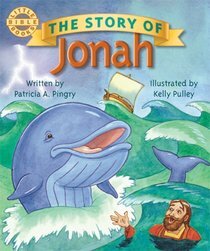 In The Story of Jonah, author Patricia A. Pingry uses only about 200 words to tell the story of Jonah -- how he chose to disobey God, was swallowed by a great fish, and was returned to dry land to do God's will. Parents can use the book to introduce Jonah and the concept of obedience to young children. About "Jonah (Little Bible Books Series)"